Some Christians do no more than penance as they outwardly conform to a set of rules. Romans 3:20 tells us that no flesh can be justified by the deeds of the Law for by it is a knowledge of sin. Galatians 5:6 tells us that the Law doesn’t count for anything for the New Testament believer. What counts is faith working through love.Therefore, true obedience to count for anything must be motivated by love. We are grateful to know our sins have been forgiven – past, present, and future and we walk on eagerly awaiting the hope of righteousness. However the key to unlock change in your life at this point in the journey is to know beyond a shadow of a doubt that even though you fail, you are ALREADY completely righteous before God. So I ask you, “Do you know you are the righteousness of God in Christ Jesus?” Without such knowledge you will lack the power for permanent change, to respond to others in love, and to pursue holy living. It is trust in the REALITY that you are forgiven, accepted, and welcomed as a righteous child of God that gives you the courage to approach God for the help you need to break free of addictions or a sinful lifestyle. Faith, hope, and courage spring forth from knowing you are right NOW perfect in God’s sight. Yes, Christ loves you so much that He didn’t just give you a clean slate to start your Christian walk from, but He gave you His record of good works so you can rest and enjoy your relationship with Him. He gave you His righteousness. It is a free gift. It was not given to you because of who you are but because of who He is. This is amazing love that when received, transforms lives! When we truly believe we have been given in Christ Jesus the gift of righteousness, and we do not have to earn it, we are enabled to respond to our rebellious teens, our grouchy spouses, and our angry co-workers and employers in love. We are enabled because we ourselves have known such amazing love. This love is the ONLY motivation powerful enough to turn self penance to true gospelized obedience where “faith is working through love” (Galatians 5:6). Do you know it? Have you embraced it? 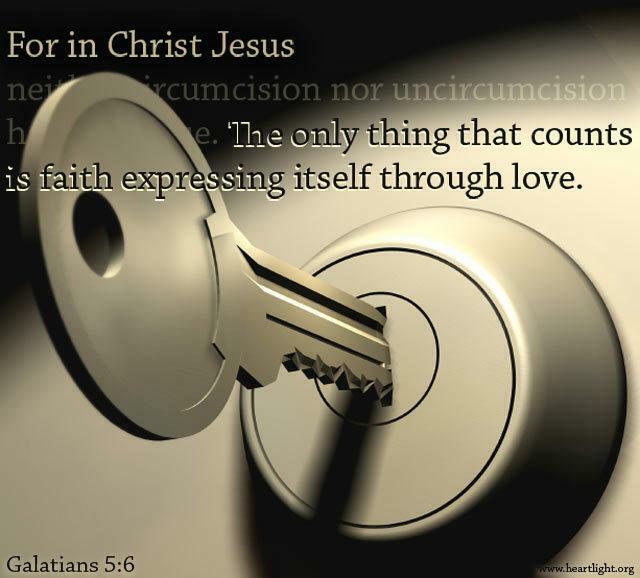 It is your key to unlock true gospel obedience!